The laws of the country require landlords to provide their tenants with rental properties that are safe and secure from a structural and health point of view. As a landlord you must have efficient security systems in place and you must conduct regular maintenance of your properties. Failure to comply with the laws, and it will be a tenant’s legal right to withhold or reduce the rent, deal with the repairs themselves and deduct the costs from the rent they pay you. They can even take the matter to the court or move out from your property without serving a proper notice period and be liable for unpaid rent. Repair and maintenance policies may vary slightly with each state, but the main clauses are pretty much the same. Obviously, you have to abide by the law, but a better step is to go ahead and do more than the laws require so that you have an extra edge if you ever have to answer in front of a judge. There are many pros of consistent repairs with the primary one being the satisfaction of your tenants, which leads to longer contract periods. If you cater to the complaints of your tenants appropriately, they will be satisfied with you, providing you with timely rents. Moreover, you will be able to retain them for longer periods of time. A defective or damaged property can result in your tenants becoming injured, the liability of which falls upon you. A clean record without any episodes of violation of the housing code or lawsuits helps you receive lower insurance premium rates. All repairs are a responsibility of the landlords. They have to keep their properties habitable so that tenants are not exposed to any risks. This holds true prior to the tenancy period and during it as well. Generally, all repairs that arise as a result of wear and tear or caused by someone other than your tenants will be payable by you. The only exception is when a tenant themselves cause the damages, and in such a situation, they will be financially responsible. 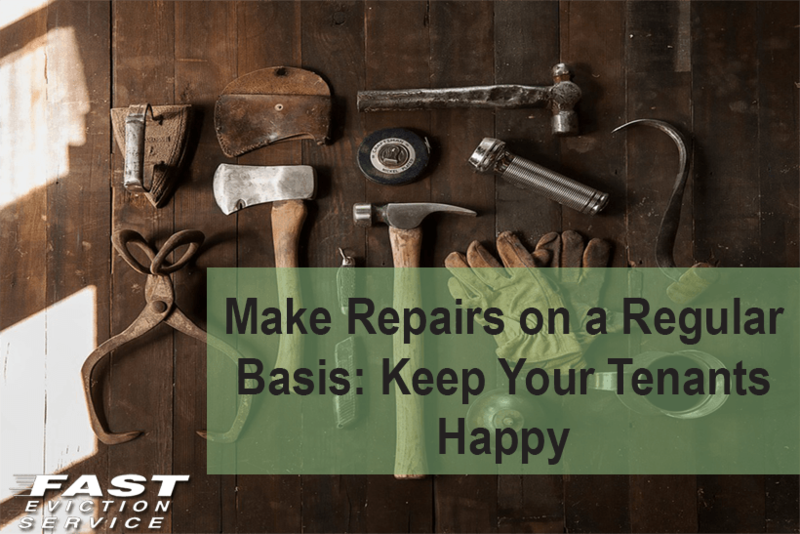 You will still have to supervise the repair but you can deduct the charges from the security deposits, adjust them in the rent or request the tenant to pay it then and there. As already mentioned, you have to ensure that the condition of the unit is habitable, and you have to do everything necessary to keep it in good condition. This includes dealing with leaking pipes, broken locks, clogged drainages and so on. Maintain all common areas and ascertain they are safe in the sense that functional alarms and smoke detectors are in place. Lightning must be adequate at night. Anything that can cause an injury or threaten security of the tenants is not acceptable. Needless to say, the property must be clean and hygienic. Pest infestations have to be dealt with before they become a nuisance. Noise pollution is not permitted on the properties. Gas, electricity, plumbing and every other utility must be operational. Annual maintenance inspection is mandatory. A proper fire and alarm system must be installed on the property. Before you rent out your property, make sure you have complied with the local and state housing codes followed in your area. Go through a copy of these, which you can obtain from the housing authority. Though you are legally liable, some of the responsibilities also fall on the tenants and they cannot go about damaging your property and equipment contained within. Make sure they know what they are obliged to do and that they follow it. Your lease agreement should also state the same. Have a written log that states all maintenance complaints, even if you received them orally.